MYLAPORE TIMES » Observing Road Safety week at Marina. Observing Road Safety week at Marina. As a part of 30th Road Safety Week from Feb 4 to Feb 10, D5 Marina Traffic Police is conducting various traffic awareness programmes throughout this week. On Feb 4, a Signature campaign was held near Gandhi Statue in Marina. A board listing the various traffic rules was put up behind the traffic police booth at the Marina. More than a thousand people who came to the beach signed the board, agreeing to follow the listed rules. 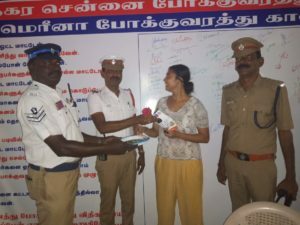 “Many officials including Mylapore traffic Assistant Commissioner Sridhar, Marina Law and order officer Jayaraj and other officials conducted this campaign,” says G.Murugesan, Marina Traffic Inspector. During the campaign, the police explained the importance of following the traffic rules to the public. Wearing helmets and avoiding drink and drive were some of the rules that were emphasised upon. “We gave flowers and chocolates to those who stopped their vehicles before the stop line at the signal in front of the Gandhi statue,” he says. “The people who were seen flouting the rules were asked not to do so in future. We explained the traffic rules and made them sign the board,” he adds. The board will be put up for some more days to spread awareness among many people. Other flex boards highlighting the traffic rules are also put up at different lamp posts. This entry was posted on Thursday, February 7th, 2019 and is filed under Civic. You can follow any responses to this entry through the RSS 2.0 feed. You can skip to the end and leave a response. Pinging is currently not allowed.